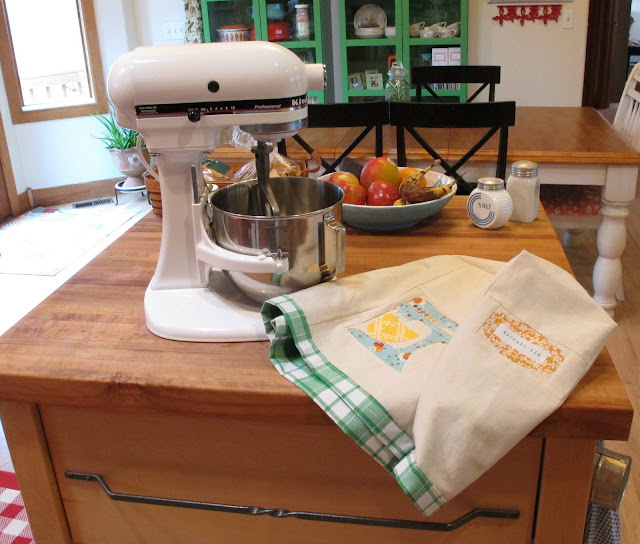 One of the exercises I had the women at my workshop do last weekend was to piece a kitchenAid. 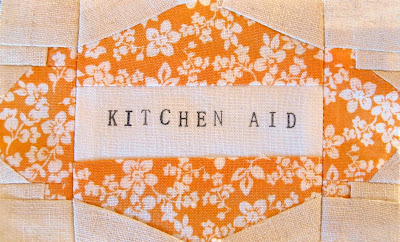 7 kitchenAids by seven women. Starting in the top row at the left and going clockwise is Tara, Randi, Jessica, Melodee, Ruth, Lisa, and Carmen! I love how I can see everyone's personality in their fabric choices. I am so proud of each and every one of them, didn't they do a fantastic job? Very, very nice work ladies!! I did't have to look far for inspiration for the 'Kitchen Classics' pattern set. 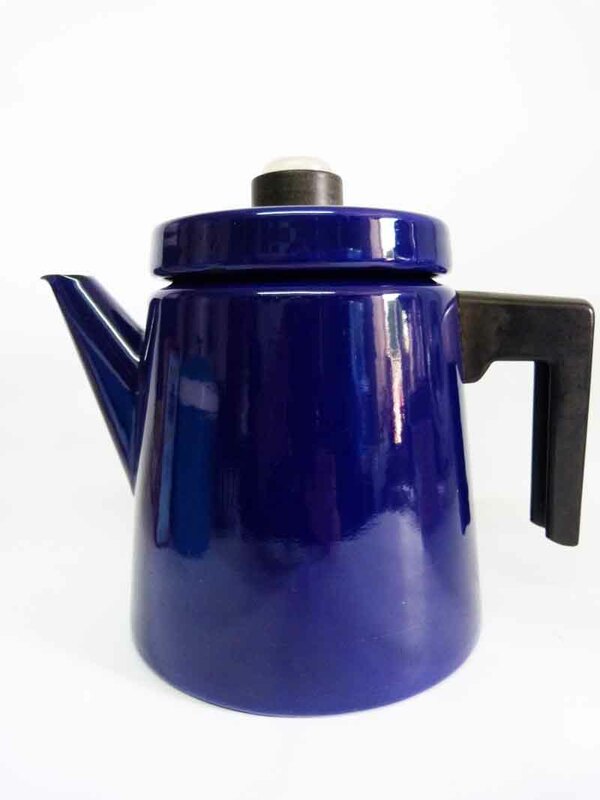 I have long been a fan of enamelware and tea kettles and coffee pots in particular. Jay at Planetutopia has beautiful pictures of her retro shop stock on Flickr and these were what I looked at to perfect the shapes for my patterns. She has generously given me permission to show some of her pics here. 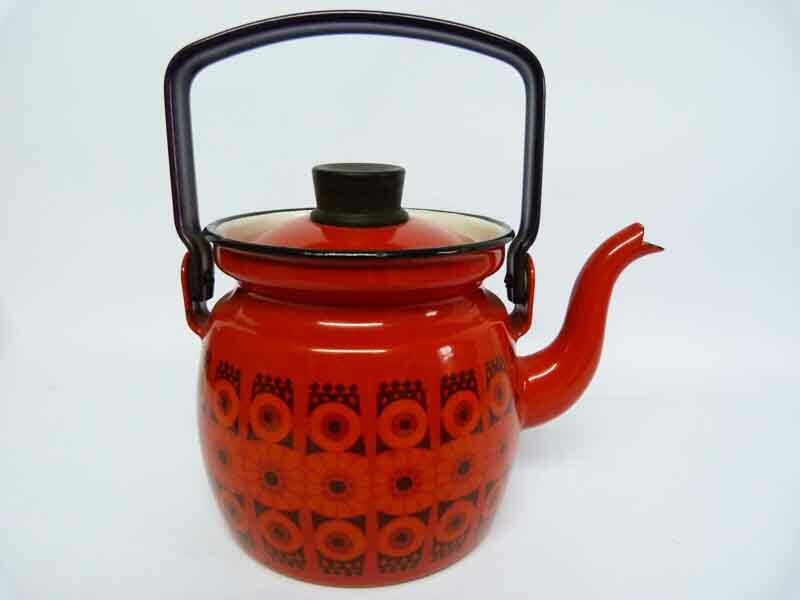 This is such a clever little tea kettle designed by Kaj Franck (shape) and Esteri Tomula (pattern/decoration) for Arabia, echoing the traditional round bellied style of a Japanese teapot and all the charm of bright 1950s1960s enamel. I do have some of their ceramics including a Esteri Tomula vase and plate found in the days before prices rocketed. The shape is so inviting, it makes me want to warm my hands around it! I dream of finding a coffee pot like this at on my vintage shopping trips, a coffee pot designed by Antti Nurmesniemi. You can see how the shape relates to the finished paper piecing pattern. I love the clean lines, the easy to hold handle, the lack of fussiness, a great bit of classic design. Maybe one day I will have these sitting on my shelf. Meanwhile I'll just look longingly and sew them instead! It's been a cold dreary day here with on again off again snow and rain, so I decided to put this pillow cover together with the block I made from Kerry's enamel coffee pot pattern (coffee pot pattern available here in the 'kitchen classics' set). The shaggy trim was a gift from my dad a few years ago from an estate sale he went to. When my dad was alive, he was my biggest crafty enabler. I was constantly getting packages of random crafty things in the mail from him and when we'd drive home to Kansas to visit, my husband always rolled his eyes at the growing pile of stuff my dad would put together to send home with me. So needless to say, this pillow cover has made me smile for many reasons, and that's just what I needed today!! I hope your weekend was filled with sunshine wherever you are!! Kitchen Classics Pattern Set Available Now! Sew-Ichigo is proud to present 'Kitchen Classics', our first pattern collection comprising of 4 paper pieced patterns full of vintage kitchen style! 4 paper pieced blocks, graded according to sewing level. A block map and photograph of how the finished block will look. The foundation pattern in separate sections, with numbers,letters and tick marks for matching sections accurately. The design as a block to enlarge/shrink if required. This is a 36 page pattern which comes in a single PDF file. You can find our shop here. This pattern is a PDF file instantly available after payment. Patterns will be delivered to your email account as soon as payment is received. You will need Adobe Reader- available for free here- installed on your computer. Payment is easy! Paypal accepts credit and debit cards, you do not need to have a Paypal account. The download link expires after three attempts. We recommend you save the files on your computer so it is there for future use. We permit small home scale production of items using these block but credit must be given to the original designers, Kerry Green and Penny Layman. No commercial production is allowed. Much whooping and celebrations going on in the UK and USA! We are both so thrilled everything is ready for you. You will be hearing more about how the patterns came about, seeing what our lovely pattern testers did with their blocks, giveaways and more, so keep checking back for more news! Our new pattern set features three 6 inch blocks and a smaller label block. 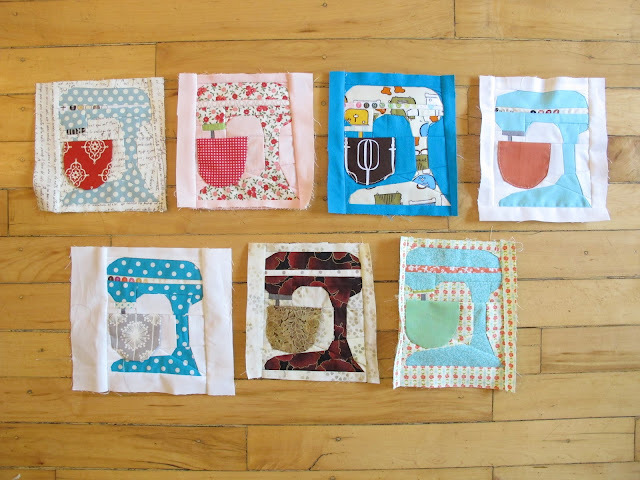 Penny has already shown you a project for the 'Ode to a KitchenAid block' and 'Vintage Label', so I have come up with a simple tote for the Enamel Coffee Pot, the Tea Kettle and the Vintage label blocks but you could use any 6 inch blocks- we will have more designs coming in the future! 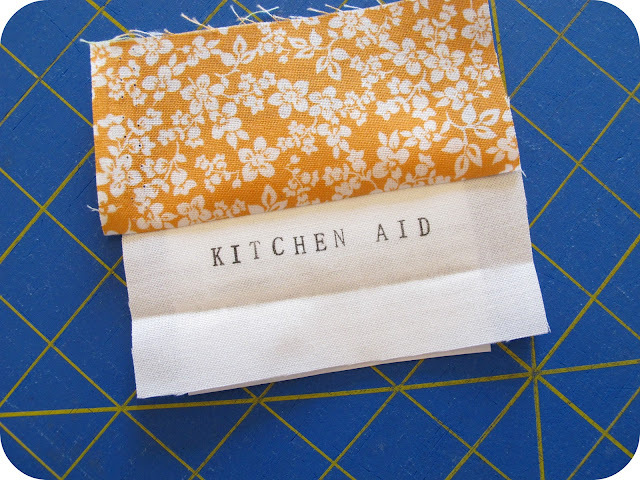 1/4 yard (long cut) handles fabric- cut into two strips each measuring 4 1/2" x 27"
Interfacing for the handles-two strips 1 1/8" x 27"
Sash the vintage label blocks to make them up to 6 1/2 inches square unfinished. I stamped my strips first (see Penny's stamping tips here) and then added strips to the sides of the label block and then across the top and bottom. Stitch the 4 blocks together and I like to press the seams open. Your front square should measure 12 1/2 inches square. Cut strips for the next stage of sashing. You will need a pair of strips measuring 2 3/4 x 12 1/2" and a pair measuring 2 x 18". Cut 2 pieces from your interfacing 17 1/2" wide x 16" high. Using a damp clean tea towel, centre the front piece and press to join the layers. Add your smaller side sashing strips, stitching through the front and the interfacing in the seam, press again with a damp cloth. Leave to cool and then quilt throught the layers at the sides. 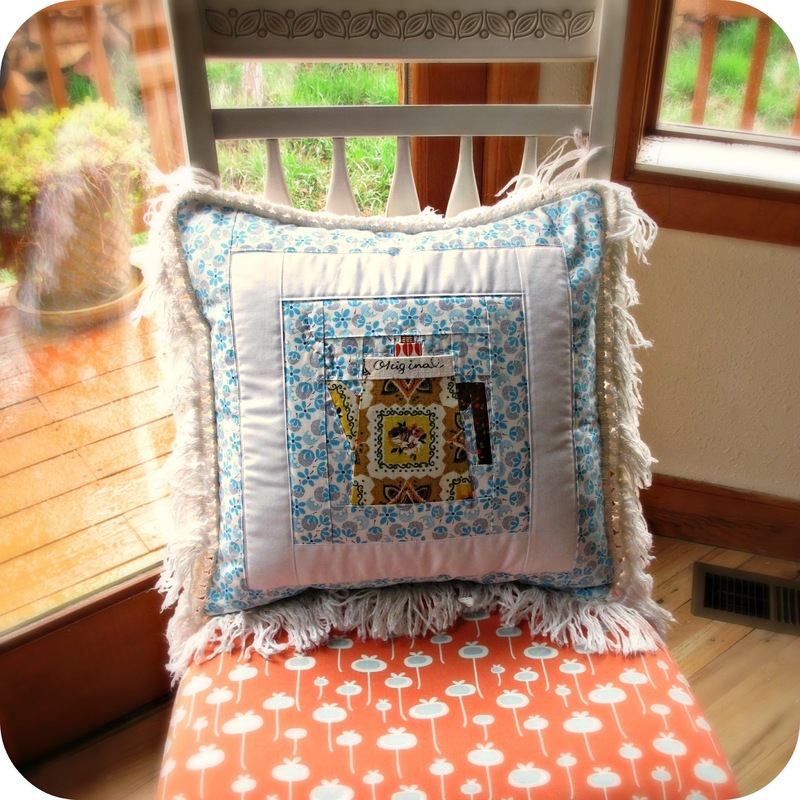 You can also quilt the pieced blocks if you wish. I stitched an outline around the tea kettle and coffee pot and added a running stitch around the tea and coffee labels. Now add your top sashing strips- these each measure 2" x 18" and quilt. 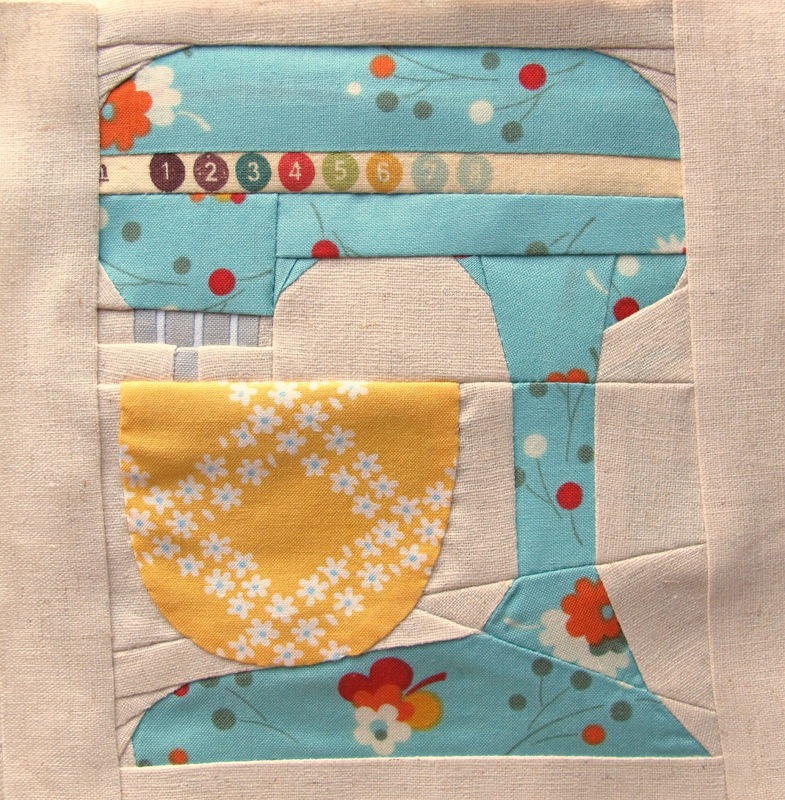 I chose straight-line quilting using the machine foot as a guide. Trim and square up the edges of the bag front. I use the front of the bag as my template to cut the back fabric. Press the back fabric to the interfacing and trim. The bag front and back should be the same size. Use front again as a template to cut the lining fabric. You will need two lining pieces. 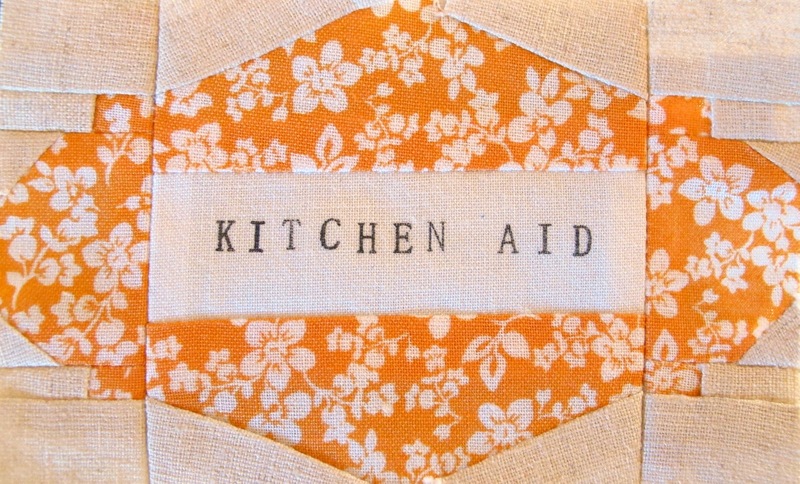 Take the handles fabric, fold each strip in half long ways and press. I then placed my interfacing so it sat against the centre fold line- press with a damp cloth to attach the interfacing. Then press the outer edges to the centre fold and keeping them tucked in, bring the folded edges into the centre to make a strap just over 1" wide. Stitch close to the edge down both sides. Place bag front and back right sides together and stitch round the sides, I used a 3/8" seam. Press the seam open the best you can, a sleeve board helps for this. Make the gussets at the corners by flattening the corner (wrong side out) so the open side seams line up with the bottom edge side seams. I pin this to hold still whilst I mark where I am going to sew. I went for a small gusset initially- the red line is 2" below and then decided I wanted to go wider. I ended up going 2 1/2" across. Check how the gusset looks on the outside before you trim and hopefully your seams will be matching up. If you want a pocket in the bag lining, now is the time to make it. I cut two rectangles, 8" x 9". Place front and back right sides together and stitch around the edge- a 1/4" seam allowance is fine here but leave a 3" gap for turning. Clip the corners, turn through and press. Top stitch along the top of the pocket edge. Place pocket centrally on the right side of one of the lining pieces, mine was about 4" down from the top edge. Pin and sew around the edges securing well at the ends of the pocket opening. Place front and back lining pieces together. Stitch around the edges but leave a 6" opening at the centre of the bottom seam. Press the seams open and add the corner gussets as in stage 5. You will need to mark the centre on the front and back of the bag upper edge. On the front the blocks do this for you but on the back place a pin. Pin the handles so there is a 6" gap between them using the centre marks to space this evenly and make sure the handles are lying downwards. Stitch the handle ends securely 1/4" from the bag top edge. Turn the lining inside out and place the bag body, right side out, inside the lining- right sides of bag and lining should be together. Make sure the handles are facing downwards. Match up the pressed open seams at the sides and pin all round the top edge. Stitch all round this edge, I used a slightly wider seam allowance of 1/2". 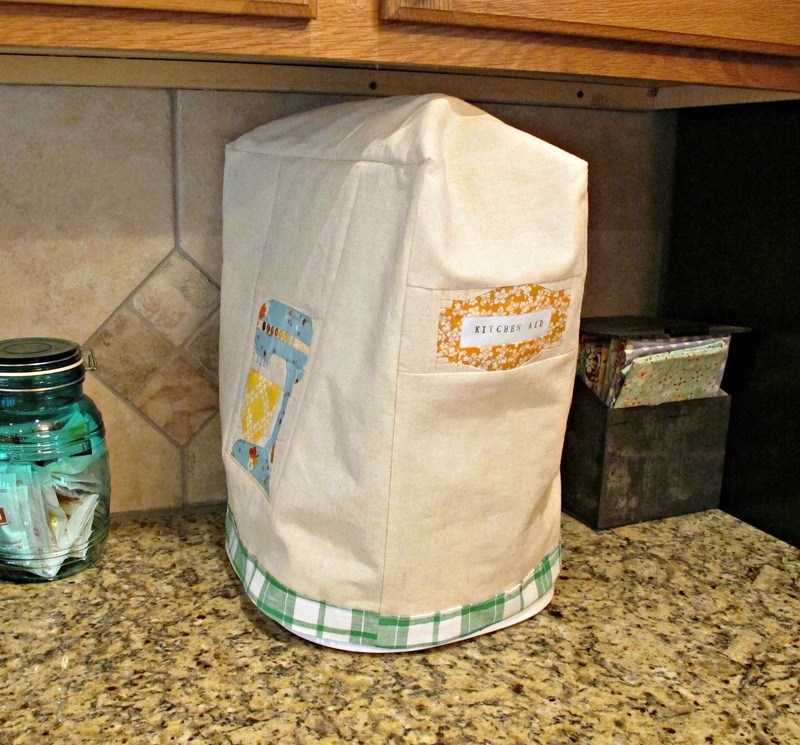 Remove pins, press and turn the bag out of the gap at the bottom of the lining. Sew the lining gap closed. I do this on my machine to make it secure but you could hand stitch if you prefer. Shake the bag out and press around the top edge. Ta dah! Finished! I should explain the reason the bag is called '#Decisions'. It is a twitter thing- the hash tag is added to different twitter discussion topics- mainly of the fairly trivial variety it has to be said. So my hypothetical topic is which is best- tea or coffee? If only my life were really this simple! Being a Brit I can't live without my tea but I do like a really good coffee, especially Italian ground, how about you? If you want to find me on Twitter my twitter name is @verykb and I tweet Sew-Ichigo updates and process pics along with other stuff. And if you make any of our patterns and blocks, do add your pictures to the new Sew-Ichigo Flickr group and we would love to share them here too! One of the things that really helps me when I am paper piecing is matching the tick marks. I use these on foundation piecing to join the sections together and in freezer paper template piecing on every piece. I don't think I could join diagonal lines accurately without them in freezer piecing! On the Sew-Ichigo patterns you will find these red tick lines on the lines where sections join. 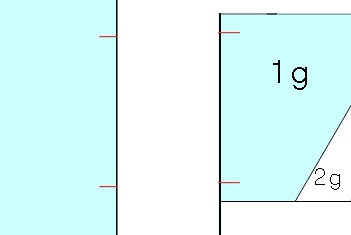 You can see a cropped image of two pattern pieces below and their corresponding red ticks. and the point comes out in the matching place on the flip side. I then pin at right angles to this to hold the seam. 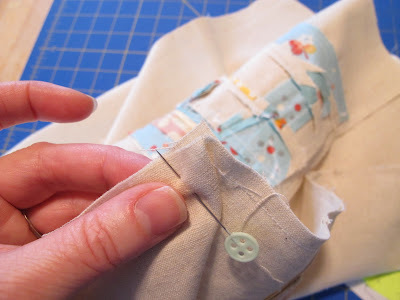 If it is a short seam I leave the vertical pins and just hold it tight all the way to the sewing machine foot. This is the same pinning from a different angle. You may prefer to sew those section seams without the paper- it does add bulk. You just trim the paper back to the edge of the pattern piece, the tick line is still there, a pin as before. On the corresponding tick mark. I recently read a post at The Sewing Directory by Lynne of Lily's Quilts where she describes exactly the same process for quilt blocks, she uses the points in the block instead of ticks . It all leads to beautiful blocks, and that is what we are all aiming for! I have added a print gadget to the bottom of all posts so you can choose a range of options to print out our tips and tutorials, handy! If you want the same gadget, you can find it here. outside fabric for front: two pieces 14 1/2"X 4 3/4", 6 1/2" X 5 1/4", 6 1/2" X 3 3/4"
outside fabric for back: 14 1/2" X 15"
outside fabric for gusset: 7" X 30", two pieces 2 3/4" X 1 5/8", 7" X 9"
binding fabric: 43" X 3 1/2"
The basic construction of this cover consist of two panels, one front and one back, and then a gusset strip down the middle. I've put my KitchenAid block on the left side because of where my KitchenAid sits on my counter, but you could easily change it to the right side if that suits you better. Also I've placed the label on the end of gusset so that you can see it as it sits on the counter. My KitchenAid is the professional model, so the measurements are for that model. The measurements I took for it are as follows: 4.5" wide at the top, 10" wide at the base, 16.5" tall, and 12.5" from front to back. If you have one of the smaller models, you may need to make adjustments to your pattern pieces to reduce them slightly so it fits better. My cover fits so it is about 1/2" off the counter along the bottom edge. All seams are 1/4" unless otherwise stated. 1. Pin the long side of the lining gusset to one of the 14 1/2" edges of the lining front panel, placing your last pin 1/4" from the end of the front panel. 2. Sew together, stopping at the last pin and back stitch. 3. Turn the corner with the gusset by folding the gusset and pinning. 5. Repeat step 3 and then sew the last part of the gusset to the panel making sure to backstitch at the beginning. Using this diagram, sew section A to the kitchenAid block, then section C to that. Then sew sections C and D to the sides of the center section to make your front outside panel. Using this diagram, sew sections E and F to the sides of the vintage label block, then section G to the top of this and section H to the bottom. Use steps 1-5 for the lining, to sew the outside cover together. Then place the wrong sides of the outside cover and the lining together, lining up the seams. There are several tutorials out there for binding, so I'm not going to reinvent the wheel here. A lovely tutorial I've used often is this one. The only change I've made is I've made it wider, and I sewed the entire thing down by machine. 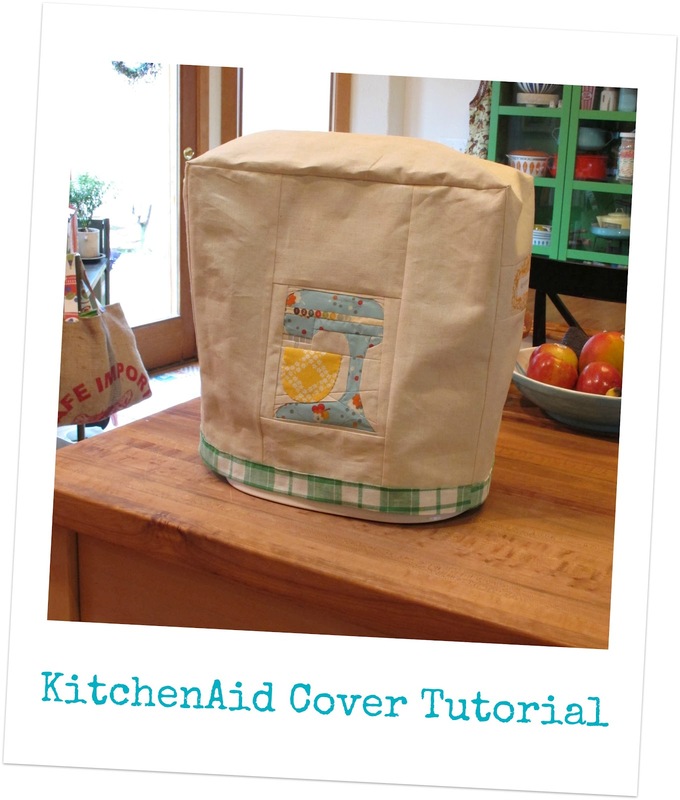 Your KitchenAid cover is complete! If you're like me, when I get near the end of a project, I get all kinds of excited and tend to start hurrying. One thing you shouldn't do though is hurry when you're stamping on a project that took a bit to make since things can go horribly wrong with ink on fabric if you're not careful! That's exactly the sort of thing I've done more than I care to say, so this last time it happened, I decided to learn from it and change things up a bit and wanted to share this quick tip with you all. If you have a paper piecing pattern that you want to stamp on, if at all possible, do the stamping first. 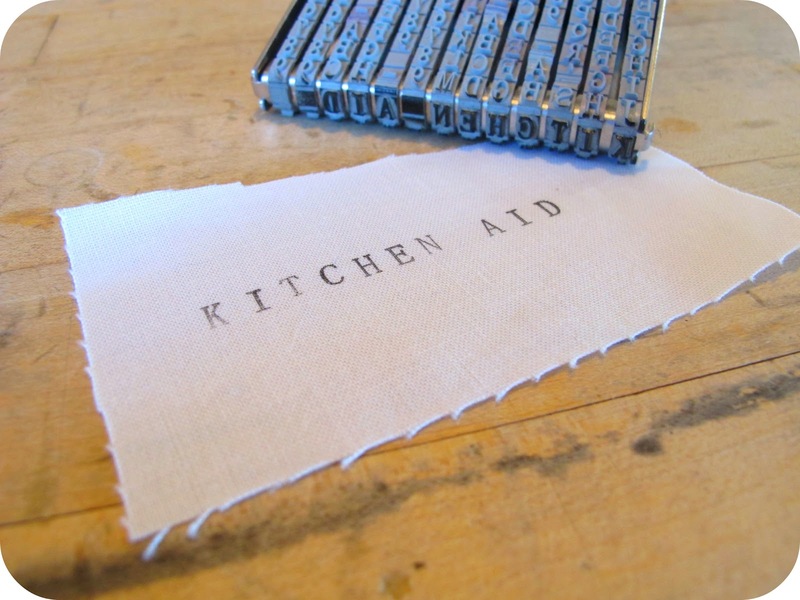 Just cut a piece of fabric larger than you will need and then stamp your words or image. Then, when it comes time to put that piece in, determine the positioning of the piece by holding it up to the light and making sure the stamping is where you want it before you sew. Kerry and I are at the tail end of finishing our first pattern set and will both be posting a tutorial here on Sew-Ichigo, using the patterns. More to come very soon!